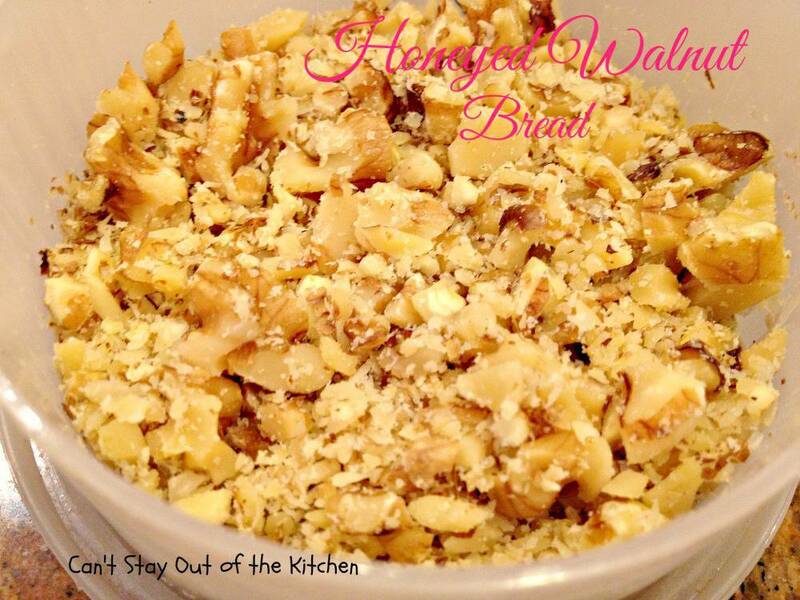 Honeyed Walnut Bread is a fantastic breadmaker bread that’s made with honey, walnuts, and walnut oil. I had seen the recipe in my Better Homes and Gardens cookbook, The Complete Guide to Bread Machine Baking, and had been looking around trying to find walnut oil so I could make it. 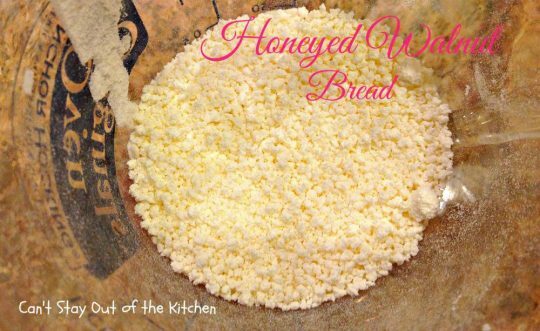 I finally found some at our local H-E-B grocery store so I snatched up a bottle and made a batch of this great tasting bread the following day! The taste is incredible and the texture is superb. 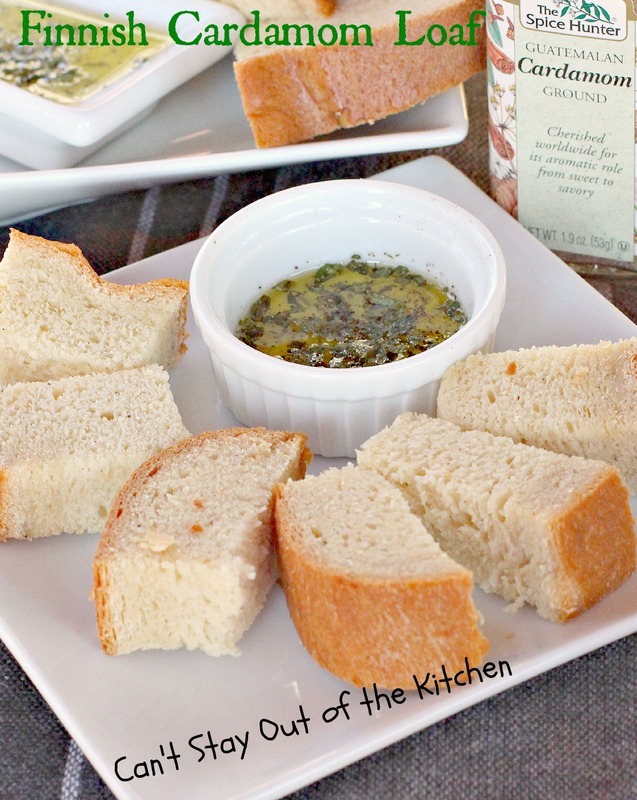 I love a soft, fluffy, homemade bread that’s not tough like some store-bought breads can be. This bread turned out so wonderfully and I love the fact that I don’t have to exert any extra effort since it’s made in the breadmaker! Almost everyone who knows me well knows that I LOVE homemade bread. I enjoy eating a slice with salad or soup, or toasting it and serving it with eggs on top or jelly. I suppose I got hooked on homemade bread early in life because my Mom ALWAYS made homemade bread. 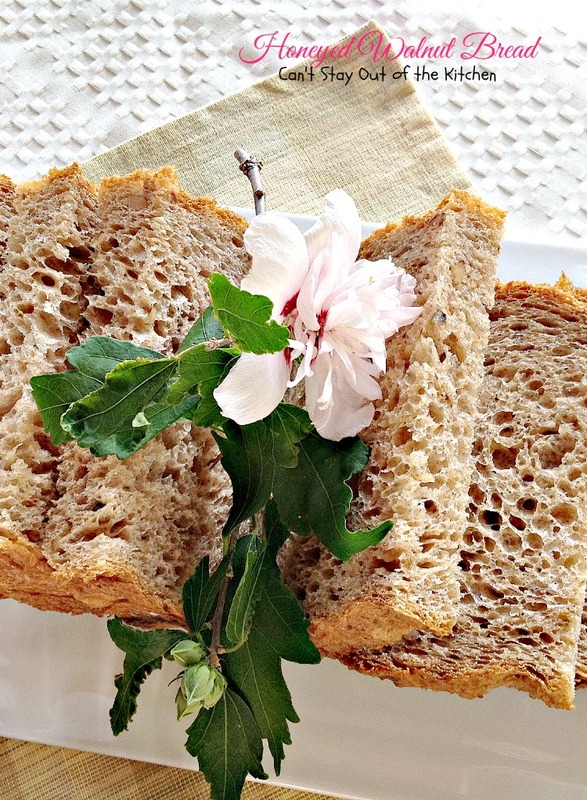 We never bought store-bought bread until I was in high school–and then only occasionally. When I made this bread a couple of weeks ago I just loved it. In spite of the fact that I love homemade bread, I’m not always easy to please. Some breads are on the bitter side, others don’t have great texture, some don’t have enough flavor, and others come out either tough or too dense. So I’m rather picky when it comes to eating a good love of homemade bread. Maybe because my Mom’s homemade bread was always so very good I’m a little spoiled when it comes to good homemade bread. However, Honeyed Walnut Bread certainly passed my stamp of approval and I plan on making this recipe again and again in the future. 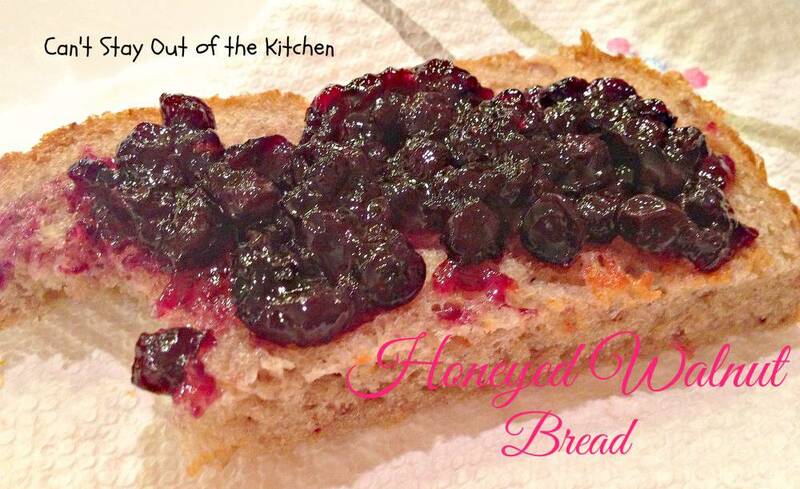 If you’re looking for a scrumptious tasting homemade bread than consider making a batch of this great bread soon. 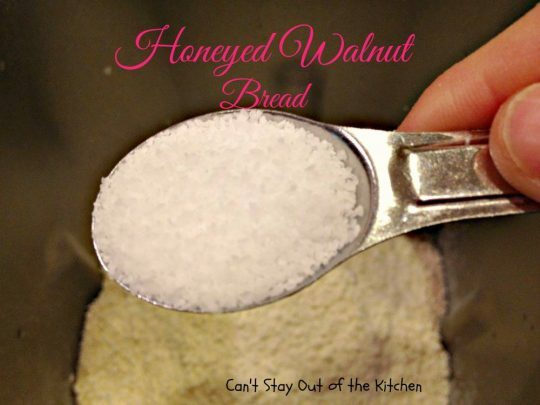 I include the amounts for a 2-pound breadmaker loaf although the cookbook also gives amounts for a 1 1/2-pound bread loaf. If you’re someone who also likes to have good homemade bread on hand frequently, I highly recommend this cookbook. I picked mine up at Half Price Books. But they also sell the book on Amazon. 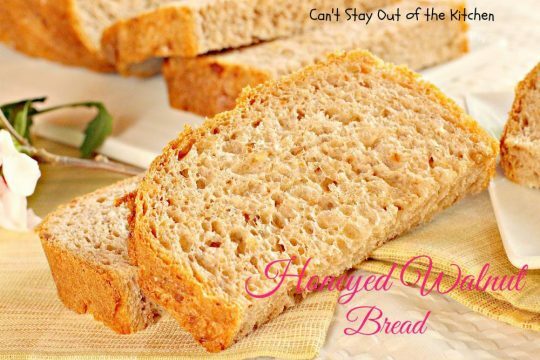 This cookbook has a couple hundred recipes just for the bread machine and they are all different. It’s really a great cookbook if you love making homemade bread in the breadmaker. I have found each recipe I’ve tried have turned out quite well. 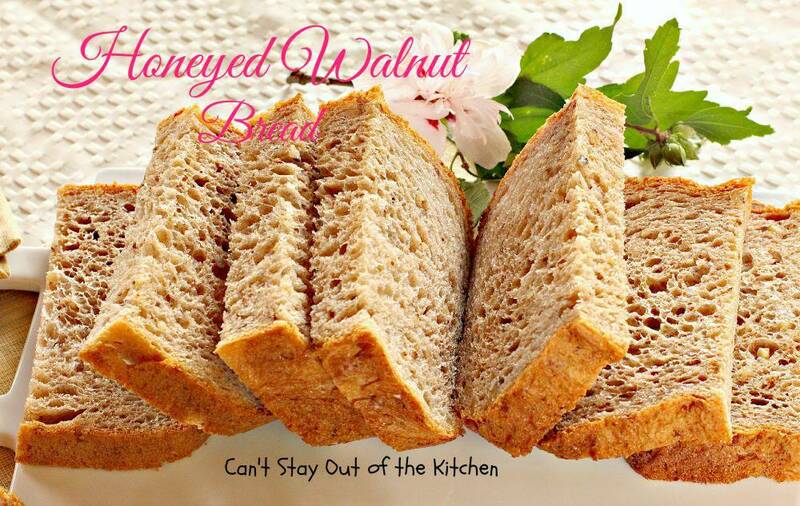 Honeyed Walnut Bread is a delicious bread you can make in the breadmaker. I enjoyed mine with honey spread. 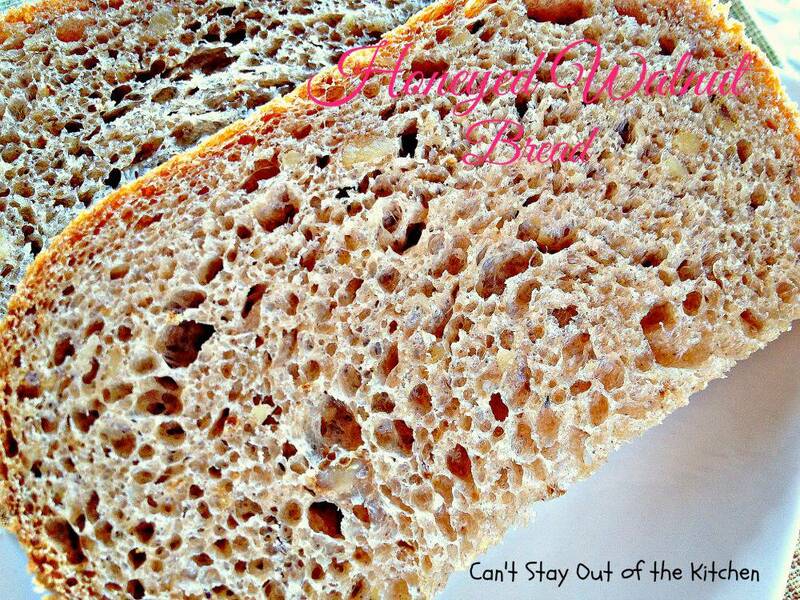 Here’s a close up so you can see the texture of the bread. 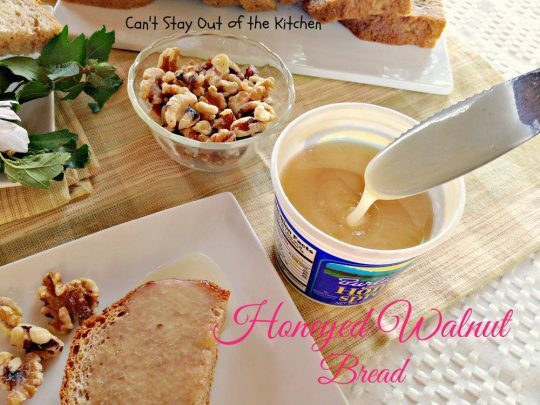 An extra dose of honey whip on the Honeyed Walnut Bread was wonderful! This bread sliced up quite well. The texture was really nice for a homemade bread recipe. 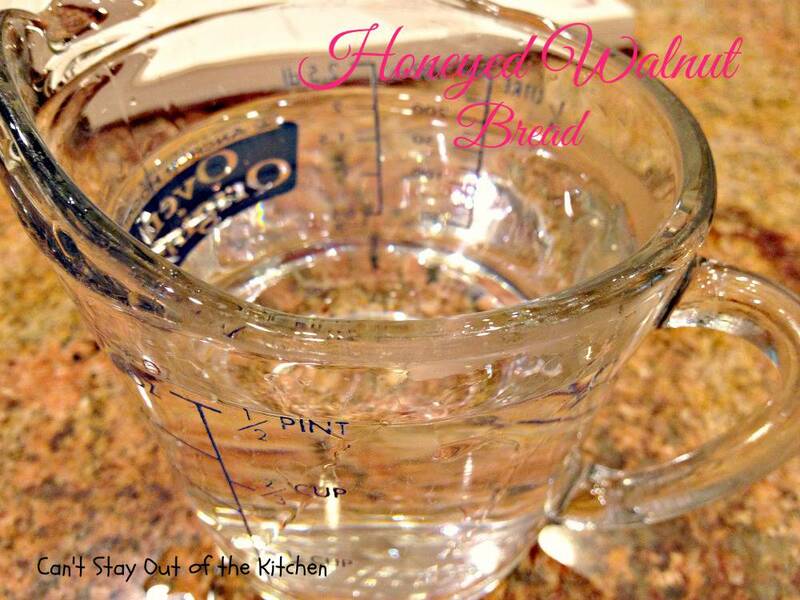 Measure hot water and place in bread canister. 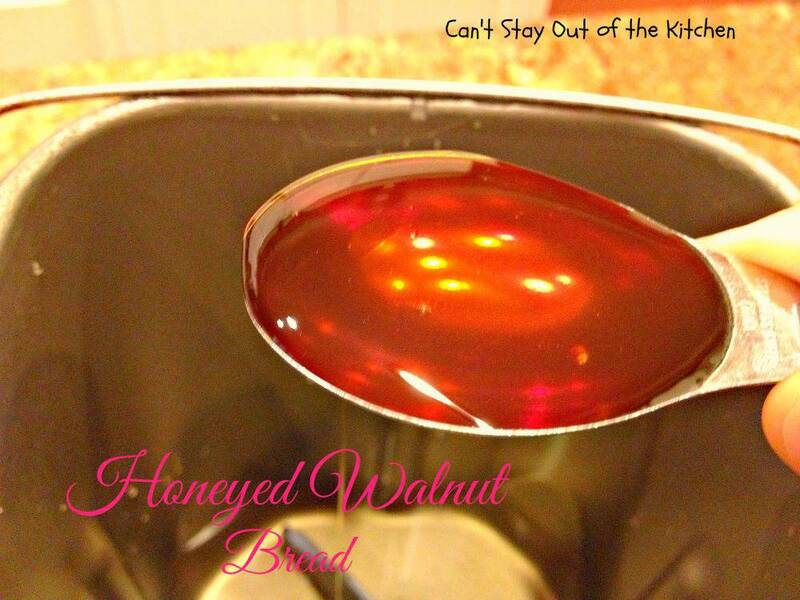 Add walnut oil. This really gave the bread a lovely flavor. Add bread flour. 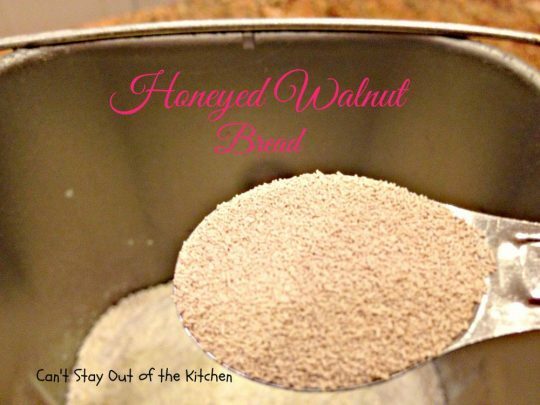 Regular all-purpose flour doesn’t have enough gluten so the bread particles won’t adhere together as well and the bread will get crumbly. Add dry nonfat milk powder. Chop walnuts fine and add to breadmaker. 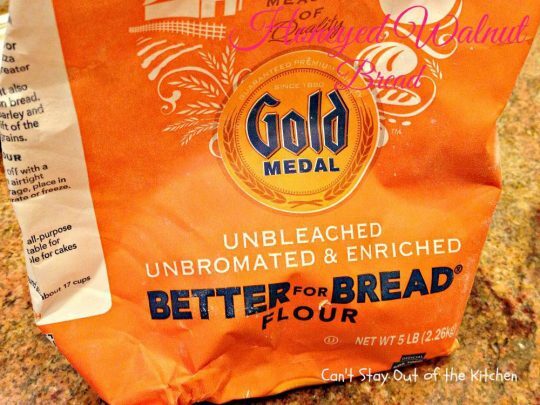 Place on regular bread setting. My breadmaker took 3 hours 50 minutes. 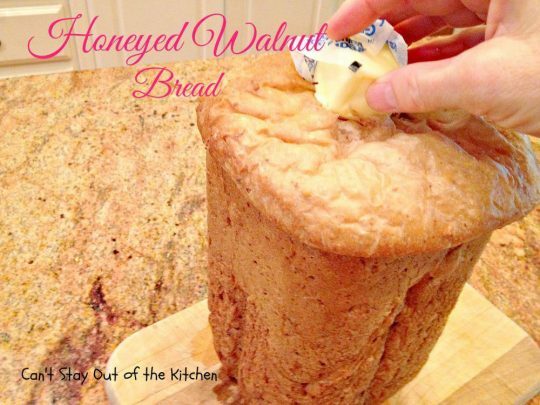 When the bread is done, allow to cool about 15 minutes before buttering the top and sides. This helps the crust to stay softer and not toughen up so much. 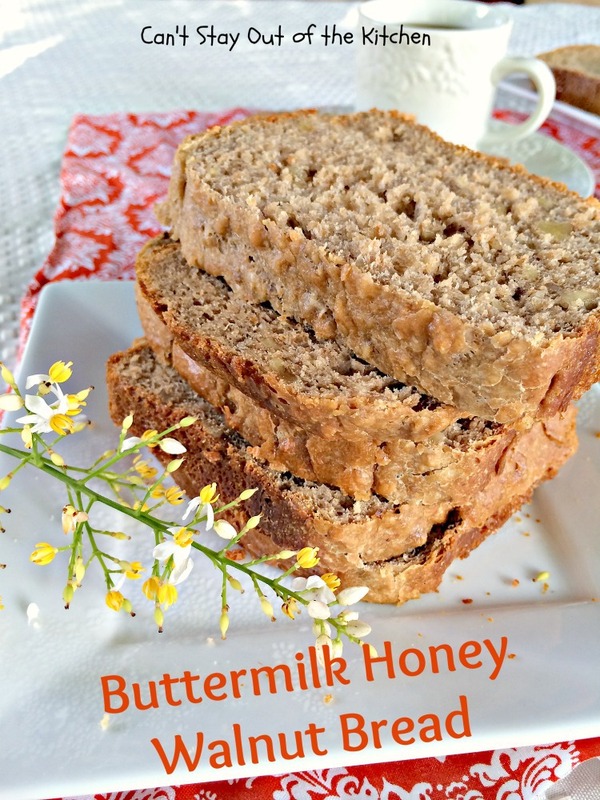 I have another recipe for Oatmeal Nut Bread that I like, too. 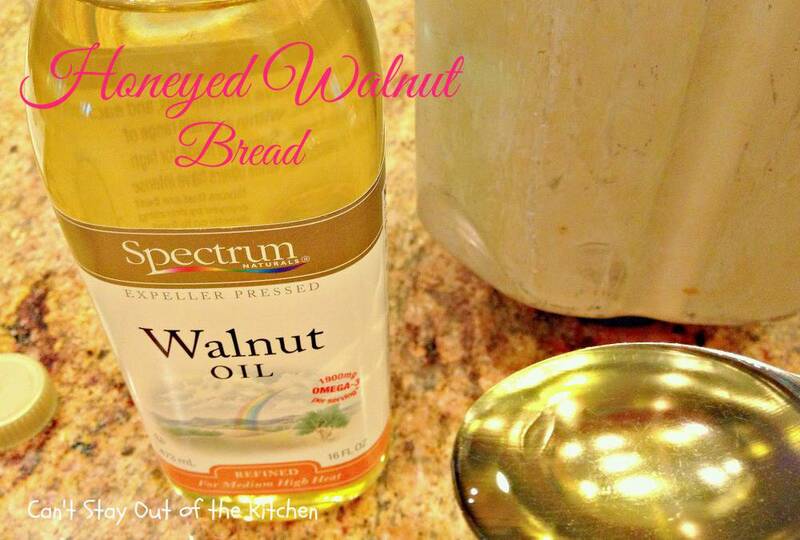 There is something about using walnuts and walnut oil in recipes that adds so much extra essence to a recipe. I like serving homemade bread with soups and salads. The texture of this bread was excellent. 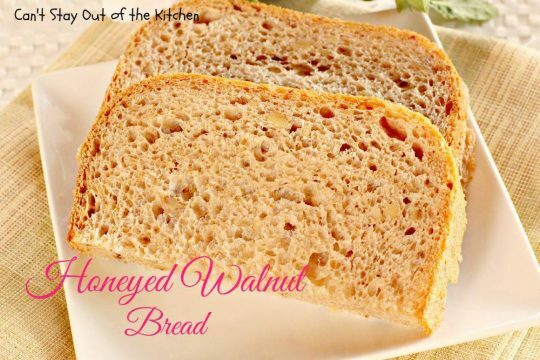 The honey added sweetness and the walnuts and walnut oil added a deep, rich flavor to this tasty breadmaker bread. You can’t have too much jelly on a slice of bread! Delicious breadmaker bread using honey, walnut oil and walnuts in the batter. Quick, easy and delicious. 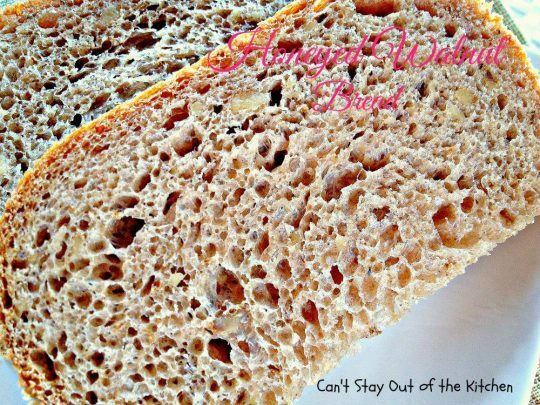 Also a great sandwich bread because of the texture. Layer ingredients in order given in bread canister. Place on regular white bread setting. Mine takes 3 hours 50 minutes. Allow bread to cool about 15 minutes before removing from oven. Remove bread from canister and butter the top and sides with butter to prevent the crust from hardening. 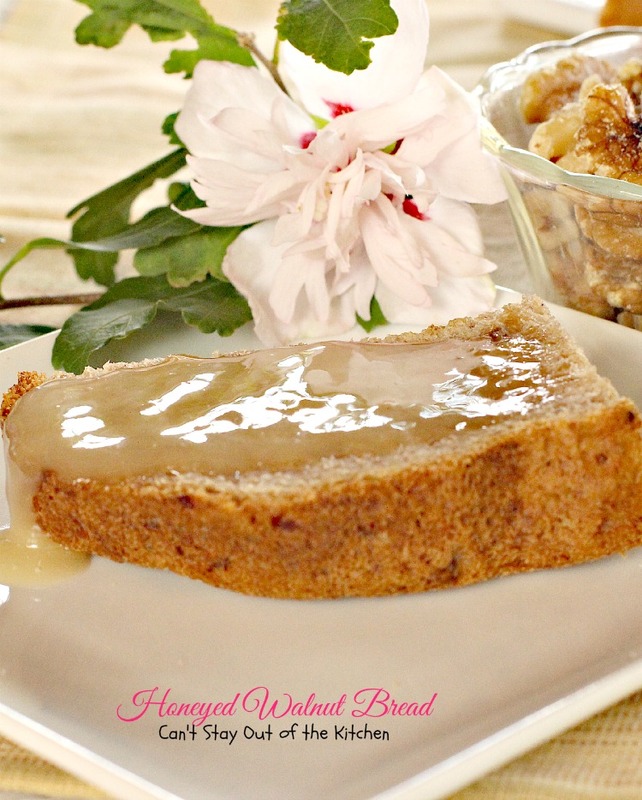 Honeyed Walnut Bread is a great breakfast bread to serve with country breakfasts with entrees like Breakfast Bake and Fried Sweet Potatoes with Pineapple. This bread is also great to use for sandwiches. Honeyed Walnut Bread is also a great bread to use in making Baked Peach French Toast. I served it several times with different jellies and jams. 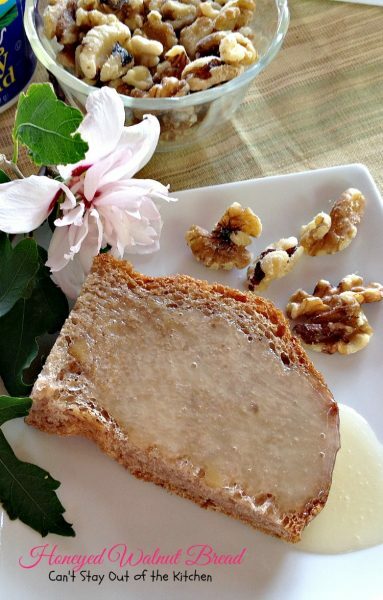 My favorite way to eat Honeyed Walnut Bread was with it dripping in honey!